Fortify Your Family Tree: Where Did Grandpa Come From? When you're trying to find documents for your ancestor, it is critical to know their original hometown. You won't find a lot of truly unique names in your genealogy research. You've got to do your homework before you grab an ancestor and run with him. For example, someone took my grandfather and placed him and his ancestors (my ancestors) in their family tree simply because of his last name. And his last name is very common throughout Italy. It's like the Smith of Italy. If this grandpa-poacher had known the hometown of her ancestors and looked at the hometown of my grandfather, she would have known he was in no way related to her. Depending on their year, ship manifests tend to be very precise about each passenger’s hometown. I’ve followed leads on many immigrants who were a good match in name and age, only to find that their hometown was in the wrong part of Italy. The hometown let me rule them out as relatives. Don’t miss the example: Case Study on 'Where Did Grandpa Come From?'. Ship manifests. I have a copy of the 1898 ship manifest that includes my great great grandparents and three of their children. That collection of names and ages is indisputable—there is no doubt they are my family. While my grandmother mentioned the town of Pastene many times, the ship manifest taught me something new. Pastene is a small section (a frazione) of a town called Sant’Angelo a Cupolo. That is the hometown on the ship manifest. Naturalization papers. My cousin’s husband Enzo passed away recently, and in his obituary I found the names of his parents and brothers whom I didn't know personally. With these names I found Enzo’s father’s naturalization papers. This gave me a photograph of Enzo’s father as well as the Italian hometown of Enzo's parents. That town name is the key to verifying any other documentation I may find for him. Passport applications. At certain times in U.S. history, your ancestor needed a passport to make sure he'd be allowed back in after visiting family in his homeland. A passport application can provide great information, including the name of your ancestor's father, his original hometown, and the names and birth dates of family members making the trip with him. You may even score a photo of the whole family. World War II draft registration cards. The same family that told me they came from Pastene would also say they came from Avellino. When I realized that Pastene is in Benevento, the province neighboring Avellino, I didn’t know what to make of this oral history fact. It was the World War II draft registration card for one of the sons from this family that gave me the answer. The card said he was born in the town of Tufo in the province of Avellino. When I viewed Tufo vital records at a Family History Center, I found that my great great grandparents’ first two children (including one who died as a child) were born in Tufo. Then, for reasons unknown, they moved to Pastene where their next four children were born. Last name prevalence. 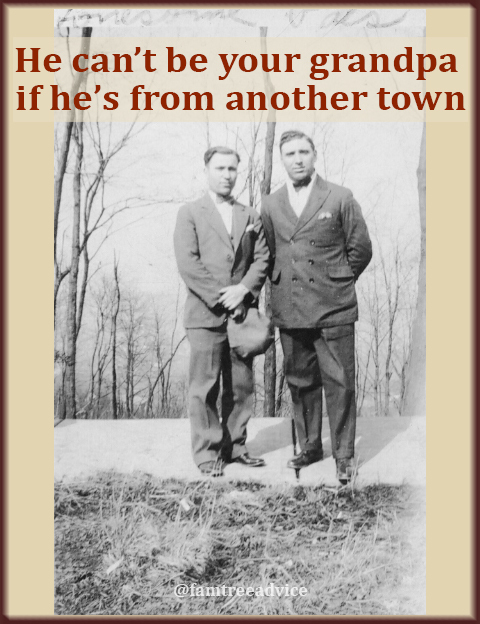 You can use various websites to see if the last name of your ancestor is or was ever prevalent in what you think is their hometown. 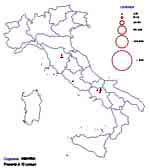 If your ancestor was Italian, you can visit http://www.gens.info/italia or https://www.cognomix.it/mappe-dei-cognomi-italiani to see where their last name is found. I'm lucky to have a maiden name that is found in very, very few places in Italy. There's a really strong chance that someone with my maiden name is related to me. Find out What To Do When Your Last Name Is So Common. Use every document you can find to discover that hometown. Then use the town name to verify potential relatives before adding them to your family tree. Case Study on "O Brother, Where Art Thou?" Case Study on "What If There's No There There?" Case Study on "Where Did Grandpa Come From?"